This durable tag with a coated front is personalized, to ensure positive identification for your dog. Personalization is on the front only, the back is plain silver metal. Includes jump ring to attach tag securely to your pet's collar. 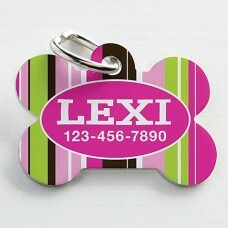 Keep your pet safe and secure with a personalized dog tag.